Farmers truly do feed the world, and M&R Feeds is very proud to be involved with farms of all sizes in the areas of food production. Like any business, farming has changed and grown with the times. Farms have become more innovative, more productive and more organized in how they continue to feed families. 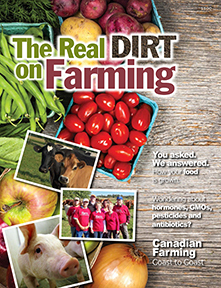 We invite you to take a look at The Real Dirt on Farming magazine - a publication of the Farm & Food Care Foundation. This publication is an easy-to-read resource for people who wish to know more about the food they eat and the farmers who produce it. Free copies are available at M&R Feeds locations in Micksburg, Pembroke and Shawville.